Consequently, the reverse repo rate under the LAF will remain unchanged at 6.0 per cent, and the marginal standing facility (MSF) rate and the Bank Rate at 7.0 per cent. 2. Since the first bi-monthly statement of April 2016, global growth is uneven and struggling to gain traction. World trade remains muted in an environment of weak demand. In the United States, growth was slow once again in Q1 because of contracting industrial activity and exports. Recent indicators of labour market activity have also weakened. In the Euro area, by contrast, Q1 GDP rose strongly on the back of robust consumer spending and recovering employment and business conditions. In Q2 so far, unemployment is falling, albeit slowly, and purchasing managers’ sentiment is upbeat. In Japan, growth surprised on the upside in Q1, with the economy escaping a technical recession, but industrial activity remains weak and deflationary pressures are building. 3. GDP growth slowed sequentially in China in Q1, with retail sales, industrial production and fixed investment showing signs of weakness in recent months amidst still rising levels of indebtedness among households and corporations. While macroeconomic stability is returning to some emerging market economies (EMEs), geo-political tensions and high volatility in financial markets impede the resumption of momentum, and the outlook remains challenging. The recent uptick in commodity prices is providing some relief to commodity exporters but political events could unsettle investor sentiment and consequently, capital flows could turn volatile again. For commodity importers, net terms of trade gains are moderating. 4. Global financial markets have recorded gains through Q2 of 2016, spurred by risk-on investor sentiment. Portfolio flows are returning, albeit hesitantly, to EME debt and equity markets. The firmness in crude prices that set in around mid-March has been supported in subsequent weeks by some temporary reductions in global supply. Gold prices remain elevated on safe haven demand. Other non-energy commodity prices remain stable with a hint of upside, while steel prices have firmed appreciably. Bond market yields across AEs have eased steadily, reflecting strong appetite in primary auctions in the face of the growing universe of negative yielding bonds. The US dollar continues to mirror changes in expectations of monetary policy action by the Fed. The yen and the euro have remained strong despite ultra-accommodative monetary policies. Among EMEs, some currencies are trading with an appreciating bias, with the biggest gains recorded by the currencies that had depreciated the most earlier. 5. 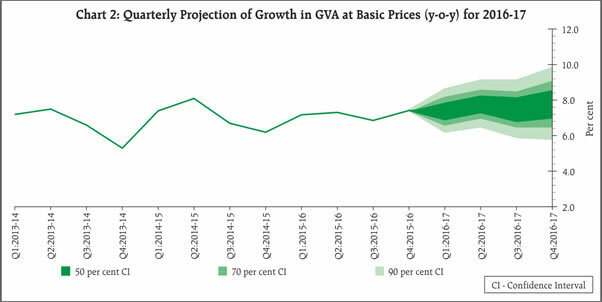 On the domestic front, the recently released provisional estimate of gross value added (GVA) for 2015-16 marginally scaled down the annual growth rate to 7.2 per cent, on a deceleration of services sector activity in relation to the advance estimates. There was, however, a sequential pickup in activity in Q4 in line with expectations. As regards the current financial year, the India Meteorological Department (IMD) has forecast an above-normal and well-distributed south west monsoon as El Nino wanes – albeit with a slightly delayed onset. Realisation of this prediction is critical for the outlook for agriculture since reservoir levels have been depleted to 17 per cent of capacity – 40 per cent lower than the level a year ago. Even though rabi procurement was lower in April-May 2016 than a year ago, mid-May food stocks at 58 million tonnes were almost three times the norm for Q1. 6. The index of industrial production decelerated in 2015-16, mainly pulled down by weak manufacturing in an environment of subdued investment demand and weak rural consumption. In May 2016, the manufacturing purchasing managers’ index (PMI) remained subdued on account of slowing output and export orders. However, except for natural gas and crude oil, the core sector registered strong growth in April 2016 on account of a seasonal pick-up in industries like electricity, also supported by a low base. There are signs that corporate performance is improving. Available information on Q4 earnings suggests double digit growth in EBITDA levels for non-financial corporates. The Reserve Bank’s latest rounds of forward looking surveys indicate an improvement in the overall business situation, driven by a pick-up in capacity utilisation and in order books – both domestic and external. These developments have improved the expectation of business conditions in the first half of 2016-17. Public investment, especially in roads and railways, is gaining strength, though the continuing weakness in private investment is of concern. Demand conditions are likely to improve going forward; consumer confidence is seen as rising on improving expectations of employment and spending, with rural demand aided by a stronger monsoon. Rising capacity utilisation should prompt private investment. 7. Some high frequency indicators for April point to a firming recovery, although it is still uneven. Leading the upturn are cargo traffic at major ports, automobile sales (especially two-wheelers and three-wheelers), commercial vehicle sales, passenger air and freight traffic, cement production and steel consumption. Abstracting from seasonal effects, this suggests that the expansion, especially in the service sector, is getting broad-based. On the other hand, railway freight traffic and passenger car sales have decelerated on sector-specific constraints. Purchasing managers in the services sector indicated slowing new business in May and subdued expectations of future activity. 8. The ebbing of inflation pressures for two consecutive months to March, after a period of steady rise, was interrupted once again in April. Retail inflation measured by the consumer price index (CPI) rose more sharply than expected due to a more-than-seasonal jump in food prices. Within the food group, inflation in respect of vegetables, fruits, sugar, meat and fish rose sizably from their prints in the previous month. Inflation in respect of pulses remained elevated; the recent decline in prices of pulses reversed, yielding a sharp increase in April. Production of pulses has fallen for the second consecutive year, according to the third advance estimates for 2015-16. There was also a firming of inflation relating to edible oils, spices and non-alcoholic beverages. Cereal inflation, however, remained subdued, reflecting supply management efforts that expanded offtake from food stocks. Inflation in respect of the fuel group eased mainly due to firewood and stronger deflation in respect of LPG prices. Reflecting these recent inflation dynamics, three-months-ahead inflation expectations of households moved up marginally in May. 9. CPI inflation excluding food and fuel edged up in April, driven by prices of petrol and diesel embedded in transport and communication. Clothing and footwear also registered moderate increases in inflation. Services inflation remained elevated on account of house rents, water charges, tuition fees and taxi/auto fares. Excluding petrol and diesel from this category, inflation was sticky and above 5 per cent. However, since growth in rural wages and corporate staff costs have been modest, cost-push factors may be subdued for the time being. 10. Despite the waning of liquidity pressures in early April, stronger-than-usual currency demand during the first two months of the financial year and build-up of cash balances by the Government from the second week of May tightened liquidity conditions from mid-May. In order to mitigate these pressures, the Reserve Bank injected liquidity through purchases under open market operations (OMOs) of ₹ 700 billion during April-May in pursuance of the revised liquidity management framework outlined in the April bi-monthly policy statement. Additionally, liquidity was injected through variable rate repos of various tenors, in addition to the regular 14-day term repos and overnight fixed rate repo and MSF. The average daily net liquidity injection through the liquidity adjustment facility (including MSF) declined from ₹ 1935 billion in March 2016 to ₹ 1030 billion during April-May and further to ₹ 120 billion in June (up to June 5, 2016). The weighted average call money rate (WACR) remained closely anchored to the policy rate within a narrower corridor of +/- 50 basis points around the policy repo rate. Volatility also declined significantly. Interest rates on money market instruments such as certificates of deposit (CDs) and commercial paper (CPs) also eased through the quarter so far. 11. Exports declined for the seventeenth consecutive month in April in US dollar terms in spite of a modest increase in volume. The fall in crude oil prices led to lower export realisations from petroleum products (POL), although the volume of shipments of petroleum products is estimated to have picked up modestly. Among non-oil items, exports of gems and jewellery, drugs and pharmaceuticals, chemicals and electronic goods improved over their levels a year ago. By contrast, exports of engineering goods declined for the ninth straight month while readymade garments recorded a fall for the fourth successive month. Imports fell sharply and across constituents – 25 items accounting for a share of 87 per cent in total imports recorded a decline; POL imports also declined, essentially reflecting lower prices. Accordingly, the trade deficit narrowed sequentially and was less than half its level a year ago. Portfolio flows resumed in April and May. The level of foreign exchange reserves rose to US $ 360 billion by May 27, 2016. 12. The inflation surprise in the April reading makes the future trajectory of inflation somewhat more uncertain. The expectations of a normal monsoon and a reasonable spatial and temporal distribution of rainfall, along with various supply management measures and the introduction of the electronic national agriculture market (e-NAM) trading portal, should moderate unanticipated flares of food inflation. In addition, capacity utilisation indicators suggest that the available headroom in industry could keep output prices subdued even as demand picks up. Nonetheless, there are upside risks – firming international commodity prices, particularly of crude oil; the implementation of the 7th Central Pay Commission awards which will have to be factored into projections as soon as clarity on implementation emerges; the upturn in inflation expectations of households and of corporates; and the stickiness in inflation excluding food and fuel. 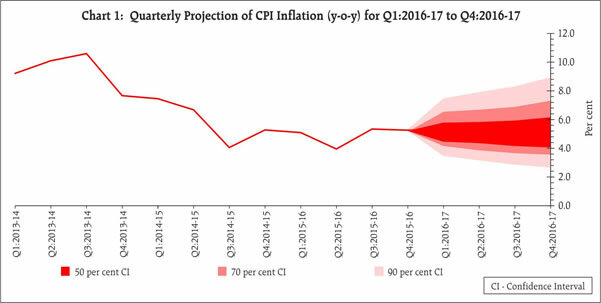 Taking these factors into account, the inflation projections given in the April policy statement are retained, though with an upside bias. Considerable uncertainty surrounds these projections (Chart 1), which should be clarified by incoming data in the next few months. 13. Domestic conditions for growth are improving gradually, mainly driven by consumption demand, which is expected to strengthen with a normal monsoon and the implementation of the Seventh Pay Commission award. Higher public sector capital expenditure, led by roads and railways, should crowd in private investment, offsetting somewhat the subdued appetite for fresh private investment due to financial stress. Yet, business confidence will be restrained to an extent on account of unrelenting global factors. On a reassessment of balance of risks, therefore, the GVA growth projection for 2016-17 has been retained at 7.6 per cent with risks evenly balanced (Chart 2). 14. In its bi-monthly monetary policy statement of April 2016, the Reserve Bank stated that it would watch macroeconomic and financial developments in the months ahead with a view to responding as space opens up. Incoming data since then show a sharper-than-anticipated upsurge in inflationary pressures emanating from a number of food items (beyond seasonal effects), as well as a reversal in commodity prices. A strong monsoon, continued astute food management, as well as steady expansion in supply capacity, especially in services, could help offset these upward pressures. Given the uncertainties, the Reserve Bank will stay on hold, but the stance of monetary policy remains accommodative. The Reserve Bank will monitor macroeconomic and financial developments for any further scope for policy action. 15. More monetary transmission to support the revival of growth continues to be critical. The government’s reform measures on small savings rates combined with the Reserve Bank’s refinements in the liquidity management framework should help the transmission of past policy rate reductions into lending rates of banks. The Reserve Bank will shortly review the implementation of the Marginal Cost Lending Rate framework by banks. Timely capital infusions into constrained public sector banks will also aid credit flow. 16. The third bi-monthly monetary policy statement will be announced on August 9, 2016.